A little Christmas tree added to the festivities. A hot grill going with a lot of sausages...they added more different kinds later...on the foil is some great chicken kabobs....I had one of those. Of course they had chicken wings...what tailgating time would be complete with out them! The pirate ship shoots the cannons off every time the Buccaneers score or get inside the 20 yard line. All throughout the game they toss beaded necklaces into the crowd. One time we sat right in front of the ship and came home with some beads. The game went into overtime. A missed pass interference call in the end zone dashed Tampa Bay's chance to win it. 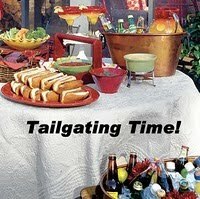 Here we for Tailgating Time week # 15 - Time for football, food, coolers full of cold ones, and game day buffets. Bring over your famous recipes for you favorite foods and party things! Come one come all! Here ye here ye! Thanks for stopping by and we would love to have your link added to our Tailgating Time! Come on and join us! it's easy, just add your link! Love all the food posted in Tailgating Time. Will submit one later. I am drooling over that pound cake, looks so moist and delicious! Hope you had a wonderful time at the game even though they played like the Dolphins - ack! 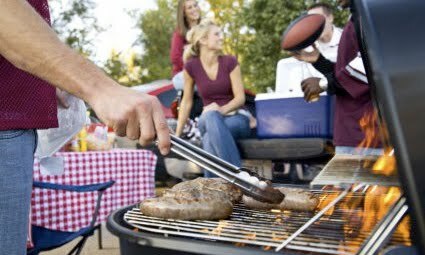 Outdoor tailgating is so fun! Are you with them? Guess, you must be so busy for the coming celebration. Take care & have lots of fun! sushi, chicken wings and yum BBQ! I wish I could be with you.....!